Here, we present a protocol based on c-FOS protein immunohistological detection, a classical technique used for the identification of neuronal populations involved in specific physiological responses in vivo and ex vivo. Perrin-Terrin, A. S., Jeton, F., Pichon, A., Frugière, A., Richalet, J. P., Bodineau, L., Voituron, N. The c-FOS Protein Immunohistological Detection: A Useful Tool As a Marker of Central Pathways Involved in Specific Physiological Responses In Vivo and Ex Vivo. J. Vis. Exp. (110), e53613, doi:10.3791/53613 (2016). Many studies seek to identify and map the brain regions involved in specific physiological regulations. The proto-oncogene c-fos, an immediate early gene, is expressed in neurons in response to various stimuli. The protein product can be readily detected with immunohistochemical techniques leading to the use of c-FOS detection to map groups of neurons that display changes in their activity. 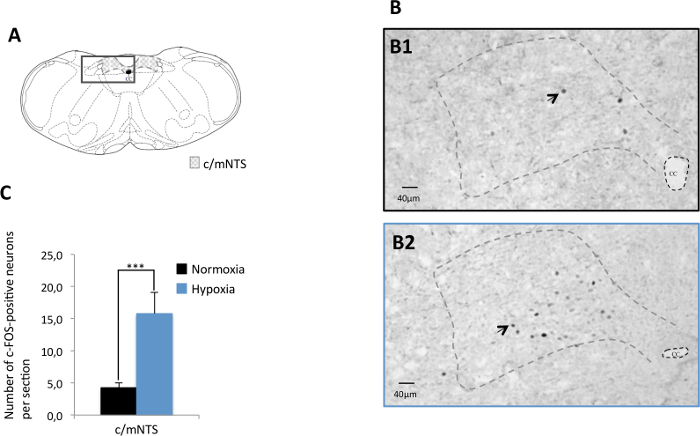 In this article, we focused on the identification of brainstem neuronal populations involved in the ventilatory adaptation to hypoxia or hypercapnia. Two approaches were described to identify involved neuronal populations in vivo in animals and ex vivo in deafferented brainstem preparations. In vivo, animals were exposed to hypercapnic or hypoxic gas mixtures. Ex vivo, deafferented preparations were superfused with hypoxic or hypercapnic artificial cerebrospinal fluid. In both cases, either control in vivo animals or ex vivo preparations were maintained under normoxic and normocapnic conditions. The comparison of these two approaches allows the determination of the origin of the neuronal activation i.e., peripheral and/or central. In vivo and ex vivo, brainstems were collected, fixed, and sliced into sections. Once sections were prepared, immunohistochemical detection of the c-FOS protein was made in order to identify the brainstem groups of cells activated by hypoxic or hypercapnic stimulations. Labeled cells were counted in brainstem respiratory structures. In comparison to the control condition, hypoxia or hypercapnia increased the number of c-FOS labeled cells in several specific brainstem sites that are thus constitutive of the neuronal pathways involved in the adaptation of the central respiratory drive. The c-fos gene was identified for the first time at the beginning of 19801,2 and its product was characterized in 1984 as a nuclear protein having gene-activator properties3,4. It participates in long-term mechanisms associated with neuron stimulation. Indeed, changes in neuronal activity lead to second messenger signaling cascades that induce the expression of the immediate early gene c-fos, which induces the production of the transcription factor c-FOS. The latter initiates the expression of late genes and thus participates in adaptive responses of the nervous system to many different types of stimuli4. Thus, since the end of 19805,6, c-FOS protein detection has been frequently used to study the effects of exogenous factors on gene transcription in general4 and on the activity of the central nervous system (CNS) for mapping out neuronal pathways involved in different physiological conditions. Basal c-fos expression has been studied in various species including mice, rat, cat, monkey, and human4. Thereby, the kinetics of its expression is relatively well known. The transcription activation is rapid (5 to 20 min)7,8, and the mRNA accumulation reaches a maximum between 30 and 45 min after the onset of stimulation9 and declines with a short half-life of 12 min. The c-FOS protein synthesis follows mRNA accumulation and could be detected by immunohistochemistry at 20 to 90 min post stimulation6. Analysis of c-fos expression is classically used in in vivo studies to identify the central respiratory network involved in the ventilatory responses to hypoxia or hypercapnia10-14. More recently, this tool was also used in ex vivo brainstem preparations to explore central respiratory network adaptations to hypoxia or hypercapnia15-18. Indeed, these preparations generate a rhythmic activity classically assimilated to the central respiratory drive19. Thus, this type of preparation has the advantage of being completely deafferented, and therefore, results regarding c-fos expression only reflect the consequences of a central stimulation without any intervention of peripheral structures. The c-FOS detection could be made by immunohistochemical or immunohistofluorescence approaches. 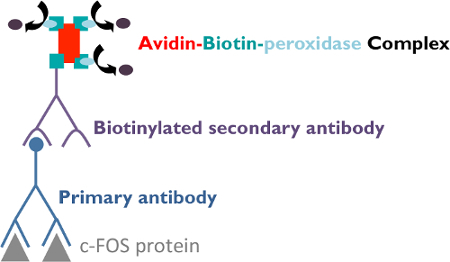 Indirect immunodetection necessitates the use of a primary antibody against c-FOS and a secondary antibody directed against the species in which the primary antibody was produced. For the immunohistochemical method, the secondary antibody is conjugated with an enzyme (peroxidase, for example) that acts on a substrate (H2O2 for the peroxidase). The product of the enzymatic reaction is developed by a chromogen (3.3-diaminobenzidine tetrahydrochloride), which stains it and can be observed under light microscopy. The reaction could be reinforced using nickel ammonium sulphate. These methods allow the detection of actives neurons during different physiological challenges and therefore the identification and/or the mapping of peripheral and central pathways involved in the consecutive physiological responses. Note: c-FOS detection is a standardized procedure involving several steps (Figure 1). All experiments were performed on rats or mice. Experimental protocols were approved by the Ethics Committee in Animal Experiment Charles Darwin (Ce5/2011/05), done in accordance with the European Communities Council Directive of September 22, 2010 (2010/63/EU) for animal care, and conducted in accordance with French laws for animal care. Prepare 0.2 M Sodium phosphate buffer: add 6.24 g NaH2PO4*2H2O and 22.56 g Na2HPO4*H2O to 1 L distilled water while stirring. Prepare 4% Paraformaldehyde (PFA): add 20 g of PFA to 150 ml distilled water. Heat the solution to 80 °C while stirring. To clear the solution, reduce heat and add 1 or 2 drops of 1 N NaOH to help the paraformaldehyde dissolve. Complete to 250 mL with distilled water and add 250 ml of 0.2 M phosphate buffer (pH 7.4). Store at 4 °C. Take appropriate care when using these reagents. Handle with gloves, lab coat, and safety goggles under a chemical hood. Note: Prepare 4% PFA on the day before the perfusions. Determine the volume of 4% PFA as a function of age, number and species of animals. Prepare cryoprotective solution: In 250 ml of 0.2 M phosphate-buffered saline, mix 5 g of Polyvinyl-pyrrolidone, 150 g of sucrose and 2.5 g of sodium chloride. After complete dissolution, add 150 ml of ethylene glycol and adjust to 500 ml with distilled water. Store the cryoprotective solution at 4 °C. Prepare 0.1 M phosphate-buffered saline (PBS): add 18 g of NaCl to 1 L distilled water while stirring. After complete dissolution, add 1 L 0.2 M of sodium phosphate buffer. Prepare Phosphate Buffered Saline supplemented with 0.3% Triton X100 (PBST): Add 3 ml of Triton X100 to 997 ml of PBS. Prepare 0.05 M Tris-Buffer (pH 7.6): add 3.03 g of Tris-Hydrochloride and 0.70 g Tris-base to 500 ml distilled water while stirring. Prepare 2% goat serum in PBST: for one plate, prepare 30 ml of solution. Add 600 µl of goat serum to 30 ml PBST and mix well. Add 2.5 ml per well. Prepare rabbit polyclonal antibody against the c-FOS protein (1:4000, sc-52) in PBST with bovine serum albumin (0.25%). For one plate, prepare 30 ml of solution. Add 75 mg of bovine serum albumin to 30 ml PBST and mix well. Then, add 7.5 µl of rabbit polyclonal antibody against the c-FOS protein. Prepare biotinylated goat anti-rabbit antibody (1:500) in PBST with serum albumin bovine (0.25%). For one plate, prepare 30 ml of solution. Add 75 mg of bovine serum albumin to 30 ml PBST and mix well. Then, add 60 µl of biotinylated goat anti-rabbit antibody. Prepare avidin-biotin-peroxidase complex (1:250) in PBST (ABC solution). For one plate, prepare 30 ml of solution. Add 120 µl of reagent A and 120 µl of reagent B to 30 ml PBST and mix well. Note: ABC solution must be prepared at least 30 min before use. Prepare substrate solution. Immediately before use, prepare the solution as follows (for one plate): add 20 mg of nickel ammonium sulfate and 10 mg of 3.3-diaminobenzidine tetrahydrochloride to 50 ml Tris-Buffer. Filter and protect from light. Add 2.0 ml per well. In the remaining solution (25 ml) add 17 µl of H2O2 (H2O2 solution 30% in H2O). Add 2.0 ml per well. Note: Appropriate care should be taken when using these reagents. Handle with gloves and lab coats. Note: Experiments were performed in rats (Sprague Dawley) or mice (C57BL/6). Place the animals in an airtight box ventilated with a hypoxic (O2 8% balanced N2) or hypercapnic (CO2 4%, O2 21% balanced N2) gas mixture for 2 hr (Figure 2A). Anaesthetize the animal with intraperitoneal injection of pentobarbital (100 mg/kg). Perfuse the animal transcardially with 4% PFA20. Handle with care and use gloves under a chemical hood. After perfusion, dissect the brain20 and immerse it in 7 ml of 4% PFA in a 15 ml tube for 48 hr at 4 °C. Then remove the brain from PFA and immerse it completely in the cryoprotective solution. Store at -18 °C (Figure 3). Dispose of the rest of the animal's body by the appropriate waste-processing pathway. Note: Cryoprotection is a step between PFA fixation and freezing. It reduces the formation of ice crystals in cells with a solution whose freezing will be in amorphous form. The fixed samples must be impregnated in the cryoprotective solution (prepared in step 1.3) for at least 24 hr at 4 °C. Handle with care and gloves under chemical hood. Note: Experiments were performed in newborn rats or mice only. Isolate the CNS as described by Suzue19. Place it in a recording chamber and superfuse it continuously with artificial cerebro-spinal fluid at a rate of 7.5 ml/min at 26 °C 21 (aCSF: in mM: 130.0 NaCl, 5.4 KCl, 0.8 CaCl2, 1.0 MgCl2, 26.0 NaHCO3, 30.0 D-glucose; saturated with O2 and adjusted to pH 7.4 by gassing with 95% O2 and 5% CO2) (Figure 2B). Replace the aCSF with a deoxygenated aCSF (same composition bubbled with 95% N2 and 5% CO2, pH 7.4) for hypoxia or by an acidified aCSF (standard aCSF with NaHCO3 reduced to 10.0 mM, bubbled with 95% O2 and 5% CO2) for hypercapnia. Apply the stimulation for 30 min (Figure 2B). Ex vivo, after the induction period, transfer the CNS of newborn mice or rats in 2.5 ml of 4% PFA in a 2.5 ml tube for 48 hr and store at -18 °C in a cryoprotective solution for later use (Figure 3). Note: Ex vivo, it is not necessary to perfuse animals. A previous study suggests that small specimens measuring less than 10 mm in diameter can be fixed by simple diffusion22. A quoted rate of penetration (distance, in mm, for the fixative diffusion into the tissue) for aldehyde is 2 or 3 mm/hr. Note: From this step to the end, the protocol is strictly the same for in vivo and ex vivo inductions. Before slicing, place one individual well insert in a 12-well plate and add 2.5 ml of PBS in each well. Make serial coronal sections (40 µm) of the brainstem with a cryostat and collect them in the 12-well plate. For the entire adult brainstem, make about 70 slices (Figure 3). Note: It is possible to section tissue from several animals in parallel in one plate. Note: Throughout the procedure, the sections remain in the well inserts. Wash the sections for 10 min with 0.1 M PBS at RT (2.5 ml per well). Repeat 3 times. Suppress the endogenous peroxidase activity by incubating the coronal sections for 30 min at RT with hydrogen peroxide H2O2, 3% in 0.1 M PBS (2.5 ml per well). Block the non specific binding site by incubating the coronal sections for 1 hr at RT with goat serum (2%) in PBST. Incubate the coronal sections for 48 hr at 4 °C with a rabbit polyclonal antibody against the c-FOS protein (1:4000, sc-52,) in PBST with bovine serum albumin (0.25%) (2.5 ml per well). Wash the sections for 10 min with PBS 0.1 M at RT (2.5 ml per well). Repeat 3 times. Incubate the coronal sections for 1 hr at RT with a biotinylated goat anti-rabbit antibody (1:500) in PBST with bovine serum albumin (0.25%) (2.5 ml per well). Note: The investigator can also use a secondary antibody coupled to a fluorescent probe at this stage. In this case, stop the protocol at this stage and examine directly using a fluorescence microscope. Wash the sections for 10 min with PBST at RT (2.5 ml per well). Repeat 3 times. Incubate the coronal sections for 1 hr with an avidin-biotin-peroxidase complex (1:250) in PBST (2.5 ml per well). Wash the sections for 10 min with PBST at RT (2.5 ml per well). Repeat 2 times. Wash the sections for 10 min with 0.05 M Tris-Buffer at RT (2.5 ml per well). Repeat 2 times. Incubate the coronal sections with 0.02% 3.3-diaminobenzidine tetrahydrochloride, 0.04% nickel ammonium sulfate and 0.01% hydrogen peroxide in 0.05 M Tris-buffer (pH 7.6) at RT (2.0 ml per well). In the remaining solution (25 ml) add 17 µl H2O2 (H2O2 solution 30% in H2O) (2.0 ml per well). Note: The investigator should determine development times under light microscope. However, 5 to 10 min provides good staining intensity. 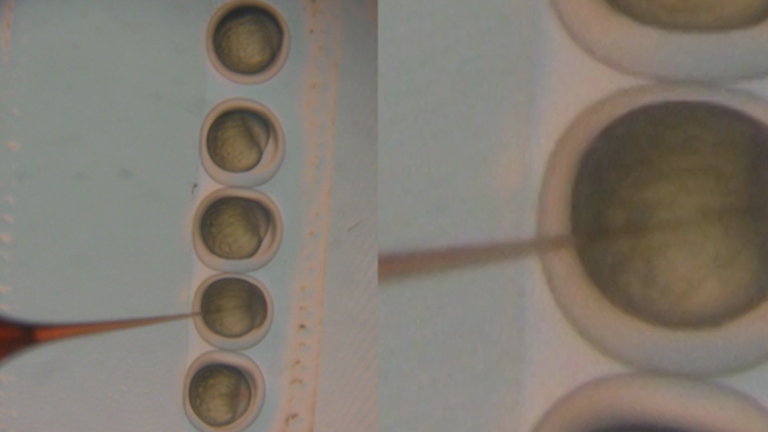 When staining intensity is optimal (controlled under light microscope, see Figure 5 and Figure 6), stop the reaction by washing the sections for 10 min with 0.1 M PBS at RT (2.5 ml per well). Repeat 4 times. Then, wash the sections with distilled water. Mount sections serially on slides and air-dry. For this, carefully spread the sections in rostro-caudal order with brushes on the slides. Clearly label the slides according to the samples. Dehydrate with absolute alcohol: immerse the slides for 30 sec at RT in absolute alcohol bath. Repeat twice. Clear with xylene: immerse the slides in xylene bath for 3 min at RT. Repeat twice. Coverslip the slides with mounting medium. For this, apply 5 drops of mounting medium on the slide and then apply the cover glass by driving out the air bubbles. Air-dry for 48 hr. Examine sections under a light microscope. Visually count FLI neurons at high magnification (200x) using standard landmarks23,24. The c-Fos punctiform staining is localized in nuclei of neurons. For each analyzed area, count the number of c-FOS-positive cells per section and compare the mean number between control and stimulated conditions. Depending on the normality of the data, use unpaired student's t test or Mann-Whitney test. Differences were considered significant if P<0.05. Plot the distribution of FLI neurons onto a drawing (magnification 100x) using a drawing tube attached to the microscope and photographed with a digital camera (Figure 5). The c-FOS detection is a useful tool that allows identifying groups of activated cells under specific conditions such as hypoxia and hypercapnia in vivo (Figure 2A) or in situations that mimic these conditions ex vivo (Figure 2B). In vivo, newborn, young, or adult rodents were placed in an airtight box in which the gaseous environment is continually renewed by a gas mixture with a composition precisely defined for 30 to 180 min13,25,26 (Figure 2A). As the stimulation acts on the whole body, the related change in c-FOS could reflect both central and peripheral activated pathways. Ex vivo, deafferented preparations containing the medulla oblongata and spinal cord were placed in a chamber continuously superfused with an aCSF with different levels of O2 or pH in order to model hypoxic or hypercapnic conditions (Figure 2B) for 30 min16-18,27. As the stimulation acts only in these deafferented preparations, it is possible to conclude that only central mechanisms were involved in the activation of cells in the c-FOS identified structures. The CNS was fixed with PFA, either by a perfusion via the systemic circulation in vivo, or by an immersion ex vivo (Figure 3). Due to this difference, the fixative diffusion is longer ex vivo than in vivo. Thus, the c-FOS signal might be affected, particularly in deep structures. However, because the c-FOS analysis is always performed in a comparative approach between control and stimulated in vivo animals or ex vivo preparations, this difference would not interfere with the results from a strict comparison of control and stimulated data. After that, the CNS was cryoprotected, sectioned, and engaged in the immunohistochemical procedure (Figure 3, Figure 4). In this way, some respiratory brainstem areas have been identified in vivo as modifying their activity under hypoxic or hypercapnic challenges, including the retrotrapezoid nucleus (RTN), which is the main central site of CO2 chemoreception10,13,28,29, the ventrolateral medulla (VLM), which contains the inspiratory rhythm generator 13, the commissural and median parts of the nucleus tractus solitarius (c/mNTS), which are the projection areas of the carotid bodies input13,25,26,30 (Figure 5), and the medullary raphe nuclei12,13. Figure 1. Study Design for the Use of c-FOS Detection to Map the Neuronal Structures Involved in the Respiratory Adaptations to Hypoxia or Hypercapnia. Chronological steps of c-FOS detection technique in the CNS. CNS: Central Nervous System; IHC: Immunohistochemistry. Please click here to view a larger version of this figure. Figure 2. C-FOS induction. (A) In vivo induction protocol. An animal was placed in a hermetic chamber and exposed to either air (21% O2; 79% N2), hypercapnic (21% O2; 4% CO2; 75% N2), or hypoxic (10% O2; 90% N2) gas mixture for 2 hr. (B) Ex vivo induction protocol. CNS was dissected out from newborn rodent aged 0 to 4 days. Medulla oblongata and spinal cord were isolated under magnification to obtain the preparations. They were placed in a chamber with the ventral surface facing upward, superfused with aCSF (pH 7.4) at 26 ± 1 °C. Modeling hypoxic stimulation in vivo was performed by reducing the fraction of O2 in the aCSF by bubbling an anoxic gas mixture containing 95% N2 and 5% CO2. Modeling hypercapnic stimulation in vivo was performed using an acid aCSF that differed from normal aCSF in terms of NaHCO3 concentration (decrease). The acid aCSF is saturated with O2 and adjusted to pH 7.23 by bubbling with 95% O2 and 5% CO2. Each stimulation condition was applied for 30 min. aCSF: artificial cerebrospinal fluid. Please click here to view a larger version of this figure. Figure 3. Central Nervous System Sampling. In vivo, the CNS was obtained by dissection after fixative procedure using 4% paraformaldehyde perfused via the vascular system. Ex vivo, the CNS was directly immersed in 4% paraformaldehyde after dissection. Subsequently, the CNS was cryoprotected by immersion in a cryoprotective solution and sliced into 40 µm thick coronal sections using a cryostat. The rostro-caudal sections of medulla were placed in a 12-well plate containing PBS before immunohistochemical procedures. CNS: Central Nervous System; PBS: Phosphate-Buffered Saline. Please click here to view a larger version of this figure. Figure 4. Indirect Immunohistochemical Procedures. The sections were first incubated with a rabbit polyclonal primary antibody against the c-FOS protein. Afterwards, they were treated with a biotinylated goat anti-rabbit secondary antibody against the primary antibody. 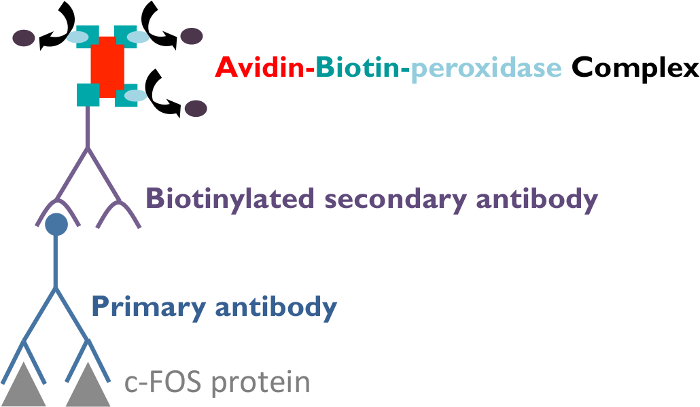 Following this incubation, sections were treated with an Avidin-Biotin-peroxidase complex, which binds tightly to the secondary antibody to amplify the signal. Indeed, the complex contains several peroxidase molecules leading to a high staining intensity. Finally, sections were stained using a solution of 3.3-diaminobenzidine tetrahydrochloride and nickel ammonium sulfate, which produces a dark gray precipitate in the presence of the peroxidase enzyme. Please click here to view a larger version of this figure. Figure 5. c-FOS-positive neurons on sections of the medulla oblongata in control mice and mice submitted to hypoxia in vivo. (A) Drawing of a section of the medulla oblongata adapted from Paxinos and Franklin24 (Bregma -7, 48 mm). The dotted area delimitates the commissural and median parts of the nucleus tractus solitarius c/mNTS. The box illustrates the structures illustrated by photomicrographs (B1 and B2). (B) Photomicrographs performed (x100) at the c/mNTS level in normoxia (B1. control, black frame) or under hypoxia (B2. blue frame). The black arrows show c-FOS-positive cells. (C) Histogram showing the mean number of c-FOS-positive cells per section at c/mNTS level in normoxia (black bar) or under hypoxia (blue bar). Values are expressed as mean ± SD. * indicates a significant difference between normoxia and hypoxia values - Student's unpaired t test; ***p< 0.001. CC: central canal of spinal cord; c/mNTS: commissural and median parts of the nucleus tractus solitarius. Please click here to view a larger version of this figure. Table 1. Immunohistological Procedure. Chronological steps of the c-FOS procedure. Ab-I, primary antibody; Ab-II, secondary antibody; BSA, Bovine Serum Albumin; DAB, 3.3-diaminobenzidine tetrahydrochloride; Ni, nickel ammonium sulphate; PBS 0.1 M, 0.1 M phosphate-buffered saline (pH 7.4); PBST, 0.1 M Phosphate-buffered saline supplemented with 0.3% Triton X-100; Serum, serum from species used for secondary antibody production. Please click here to view a larger version of this figure. C-fos is an immediate early gene, and the detection of its product, the c-FOS protein, is classically used to identify neuronal populations involved in specific respiratory responses in vivo11,13,25,28 and ex vivo16-18,27,32,33. Be careful during the perfusion step. The 4% PFA solution must be well prepared and the fixation and post-fixation steps must be long enough to obtain optimal slicing and staining. Furthermore, the revelation is the most important step of the procedure; the intensity of the staining should be controlled to avoid background noise. Although some neurons do not seem to express the c-fos gene5, this method has been proved to be useful to determine neural pathways activated, for example in respiratory rhythm adaptation during chemical challenges. Compared to other immediate early genes, c-fos has a low expression in the absence of stimulation, allowing easier quantification of neuronal activity under a test situation6. The c-FOS detection is a cellular technique that indicates global changes in activity in order to analyze neuronal populations involved in response to several stimuli. Compared with neuronal activity analysis using an electrophysiological approach, which most of the time concerns only a small number of cells in a defined brain area, c-FOS detection permits one to appreciate changes of activity in a large number of cells and therefore to define active areas in the whole CNS. C-FOS detection is easily compatible with unrestrained and awake animals, which is not the case during neuronal activity recording by electrophysiology. This is an advantage because it avoids stress and interference of anesthetics with the obtained results. Ex vivo, we used a 30 min period of stimulation. It was previously shown that this stimulation is sufficient to induce changes in c-fos expression at the neuronal level34-36. Five min of stimulation are sufficient to induce changes in c-fos expression, which are observed after a latent period of 15 to 20 min37. The related increases in c-fos expression are related to changes in activity taking place during the first 10 min of stimulation. Following stimulation, a delay is required before the accumulation of c-FOS in the nucleus. This delay of about 30 min corresponds to mRNA and protein synthesis. This item is opposed to the immediacy of the results that may be obtained by recording the activity of neurons with electrophysiology. This can cause a loss of information about rapid changes in neuronal activity after a specific and transient stimulus. As c-FOS protein may have a half-life of 90 to 100 min4, its expression could be affected by the surgical procedures or stress associated with the manipulation of the animal, its constraint, or changes in its environment. Thus, it is necessary to minimize manipulations that could induce changes in neuronal activity not related to the studied stimulus and to perform tissue sampling immediately after the end of the physiological stimulus. 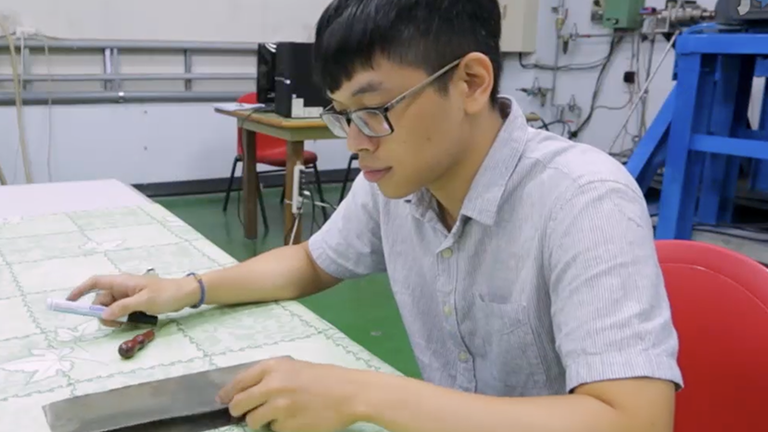 In this protocol, the revelation step used a solution that contained 3.3-diaminobenzidine tetrahydrochloride, nickel ammonium sulphate, and hydrogen peroxide, but the commercial kits for peroxydase could also be used for this step. The University Paris 13 supported this work. ASPT was supported by a University Paris 13 fellowship and the "Association Française pour le Syndrome d'Ondine". FJ was supported by a Laboratory of Excellence GR-Ex fellowship. The GR-Ex (ref ANR-11-LABX-0051) is funded by the program "Investissement d'avenir" of the French National Research agency (ref ANR-11-IDEX-0005-02). Curran, T., Teich, N. M. Identification of a 39,000-dalton protein in cells transformed by the FBJ murine osteosarcoma virus. Virology. 116, 221-235 (1982). Curran, T., MacConnell, W. P., van Straaten, F., Verma, I. M. Structure of the FBJ murine osteosarcoma virus genome: molecular cloning of its associated helper virus and the cellular homolog of the v-fos gene from mouse and human cells. Mol Cell Biol. 3, 914-921 (1983). Curran, T., Miller, A. D., Zokas, L., Verma, I. M. Viral and cellular fos proteins: a comparative analysis. Cell. 36, 259-268 (1984). Herdegen, T., Leah, J. D. Inducible and constitutive transcription factors in the mammalian nervous system: control of gene expression by Jun, Fos and Krox, and CREB/ATF proteins. Brain Res Brain Res Rev. 28, 370-490 (1998). Dragunow, M., Faull, R. The use of c-fos as a metabolic marker in neuronal pathway tracing. J Neurosci Methods. 29, 261-265 (1989). Bullitt, E. Expression of c-fos-like protein as a marker for neuronal activity following noxious stimulation in the rat. J Comp Neurol. 296, 517-530 (1990). Greenberg, M. E., Ziff, E. B. Stimulation of 3T3 cells induces transcription of the c-fos proto-oncogene. Nature. 311, 433-438 (1984). Greenberg, M. E., Greene, L. A., Ziff, E. B. Nerve growth factor and epidermal growth factor induce rapid transient changes in proto-oncogene transcription in PC12 cells. J Biol Chem. 260, 14101-14110 (1985). Muller, R., Bravo, R., Burckhardt, J., Curran, T. Induction of c-fos gene and protein by growth factors precedes activation of c-myc. Nature. 312, 716-720 (1984). Teppema, L. J., Berkenbosch, A., Veening, J. G., Olievier, C. N. Hypercapnia induces c-fos expression in neurons of retrotrapezoid nucleus in cats. Brain Res. 635, 353-356 (1994). Teppema, L. J., et al. Expression of c-fos in the rat brainstem after exposure to hypoxia and to normoxic and hyperoxic hypercapnia. J Comp Neurol. 388, 169-190 (1997). Larnicol, N., Wallois, F., Berquin, P., Gros, F., Rose, D. c-fos-like immunoreactivity in the cat's neuraxis following moderate hypoxia or hypercapnia. J Physiol Paris. 88, 81-88 (1994). Bodineau, L., Larnicol, N. Brainstem and hypothalamic areas activated by tissue hypoxia: Fos-like immunoreactivity induced by carbon monoxide inhalation in the rat. Neuroscience. 108, 643-653 (2001). Erickson, J. T., Millhorn, D. E. Hypoxia and electrical stimulation of the carotid sinus nerve induce Fos-like immunoreactivity within catecholaminergic and serotoninergic neurons of the rat brainstem. J Comp Neurol. 348, 161-182 (1994). Bodineau, L., et al. Consequences of in utero caffeine exposure on respiratory output in normoxic and hypoxic conditions and related changes of Fos expression: a study on brainstem-spinal cord preparations isolated from newborn rats. Pediatr Res. 53, 266-273 (2003). 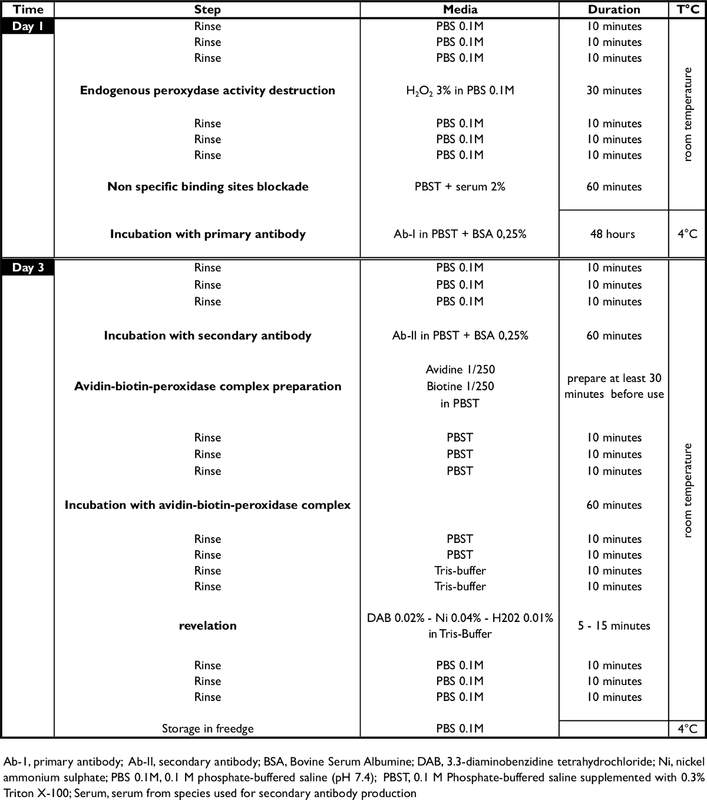 Voituron, N., Frugiere, A., Gros, F., Macron, J. M., Bodineau, L. Diencephalic and mesencephalic influences on ponto-medullary respiratory control in normoxic and hypoxic conditions: an in vitro study on central nervous system preparations from newborn rat. Neuroscience. 132, 843-854 (2005). Voituron, N., Frugiere, A., Champagnat, J., Bodineau, L. Hypoxia-sensing properties of the newborn rat ventral medullary surface in vitro. J Physiol. 577, 55-68 (2006). Voituron, N., et al. The kreisler mutation leads to the loss of intrinsically hypoxia-activated spots in the region of the retrotrapezoid nucleus/parafacial respiratory group. Neuroscience. 194, 95-111 (2011). Suzue, T. Respiratory rhythm generation in the in vitro brain stem-spinal cord preparation of the neonatal rat. J Physiol. 354, 173-183 (1984). Gage, G. J., Kipke, D. R., Shain, W. Whole animal perfusion fixation for rodents. J Vis Exp. e3564 (2012). 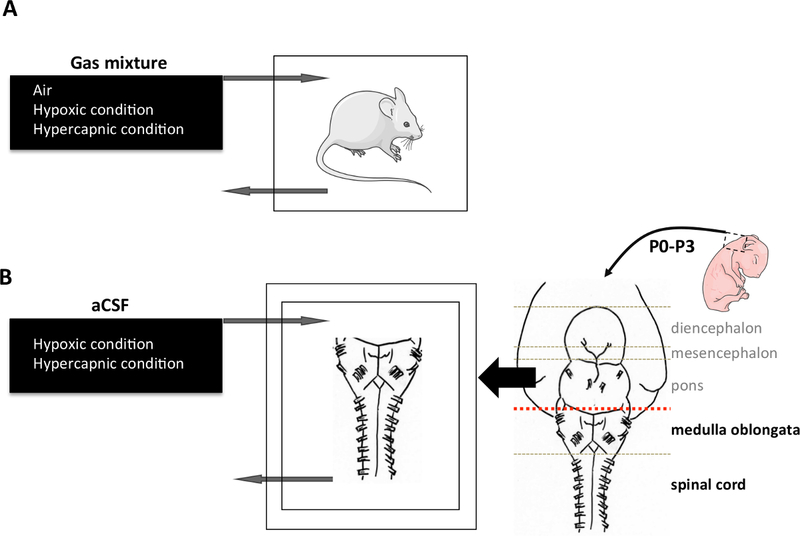 Rousseau, J. P., Caravagna, C. Electrophysiology on isolated brainstem-spinal cord preparations from newborn rodents allows neural respiratory network output recording. J Vis Exp. e53071 (2015). Start, R. D., Layton, C. M., Cross, S. S., Smith, J. H. Reassessment of the rate of fixative diffusion. J Clin Pathol. 45, 1120-1121 (1992). Paxinos, G., Watson, C. The rat brain in stereotaxic coordinates. 4th ed, Academic Press. CA. (1998). Paxinos, G., Franklin, K. B. The mouse brain in stereotaxic coordinates. 2nd ed, Academic Press. CA. (2001). Berquin, P., Bodineau, L., Gros, F., Larnicol, N. Brainstem and hypothalamic areas involved in respiratory chemoreflexes: a Fos study in adult rats. Brain Res. 857, 30-40 (2000). Berquin, P., Cayetanot, F., Gros, F., Larnicol, N. Postnatal changes in Fos-like immunoreactivity evoked by hypoxia in the rat brainstem and hypothalamus. Brain Res. 877, 149-159 (2000). Bodineau, L., Cayetanot, F., Frugiere, A. Fos study of ponto-medullary areas involved in the in vitro hypoxic respiratory depression. Neuroreport. 12, 3913-3916 (2001). Takakura, A. C., et al. Peripheral chemoreceptor inputs to retrotrapezoid nucleus (RTN) CO2-sensitive neurons in rats. J Physiol. 572, 503-523 (2006). Mulkey, D. K., et al. Respiratory control by ventral surface chemoreceptor neurons in rats. Nat Neurosci. 7, 1360-1369 (2004). Finley, J. C., Katz, D. M. The central organization of carotid body afferent projections to the brainstem of the rat. Brain Res. 572, 108-116 (1992). Bodineau, L., et al. Data supporting a new physiological role for brain apelin in the regulation of hypothalamic oxytocin neurons in lactating rats. Endocrinology. 152, 3492-3503 (2011). Okada, Y., Chen, Z., Jiang, W., Kuwana, S., Eldridge, F. L. Anatomical arrangement of hypercapnia-activated cells in the superficial ventral medulla of rats. J Appl Physiol (1985). 93, 427-439 (2002). Saadani-Makki, F., Frugiere, A., Gros, F., Gaytan, S., Bodineau, L. Involvement of adenosinergic A1 systems in the occurrence of respiratory perturbations encountered in newborns following an in utero caffeine exposure. a study on brainstem-spinal cord preparations isolated from newborn rats. Neuroscience. 127, 505-518 (2004). Morgan, J. I., Cohen, D. R., Hempstead, J. L., Curran, T. Mapping patterns of c-fos expression in the central nervous system after seizure. Science. 237, 192-197 (1987). Sagar, S. M., Sharp, F. R., Curran, T. Expression of c-fos protein in brain: metabolic mapping at the cellular level. Science. 240, 1328-1331 (1988). Herdegen, T., Kovary, K., Leah, J., Bravo, R. Specific temporal and spatial distribution of JUN, FOS, and KROX-24 proteins in spinal neurons following noxious transsynaptic stimulation. J Comp Neurol. 313, 178-191 (1991). Marina, N., Morales, T., Diaz, N., Mena, F. Suckling-induced activation of neural c-fos expression at lower thoracic rat spinal cord segments. Brain Res. 954, 100-114 (2002).